Japanese iOS users can browse 'em all in Nintendo's first paid app. Despite the popularity of the iOS platform, mega-publisher Nintendo hasn't embraced it. This makes sense, of course, since Nintendo has its own handheld system to deal with, but it seems like releasing retro Nintendo games for iPhones and iPads could make the publisher a lot of money without a lot of effort. Nintendo seems to have realized this, because it's releasing its first paid iOS app at some point in the foreseeable future. 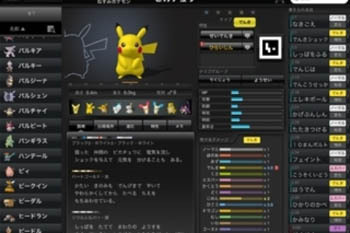 Finally, iOS users without a 3DS will be able to take the PokÃ©dex with them wherever they go--at least in Japan. The 3DS already has free and paid PokÃ©dex apps (though the free version was discontinued earlier this year), so making another portable version of the interactive PokÃ©mon encyclopedia is a sensible move. The iOS PokÃ©dex, which is currently only planned for a Japanese release, is being published by Nintendo subsidiary The PokÃ©mon Company, and developed by fellow subsidiaries Creatures Inc. and Game Freak. The app will launch with only 150 PokÃ©mon, with more available in add-on packs. The PokÃ©dex itself is Â¥170, with additional content available for Â¥500 a pop. This actually isn't the first time the publisher has released a downloadable app for non-Nintendo systems; PokÃ©mon Say Tap?, a free app, was available on iOS and Android systems for a brief time last year. There's no word on an official release date for the PokÃ©dex, or whether it will come to other regions.